I’m still searching for a board game producer who can mass produce Net-Map boxes at the price and quality that makes sense. Today I found bluepanther, who look interesting and from their website I landed in a different universe that was unknown to me before: The world of Piecepack. The piecepack website has an ever growing list of games that you can play with the boardgame parts. The sets of rules are developed and uploaded by passionate players. In ChoosySushi you are an overworked waiter in a sushi restaurant, in Interstellar Contest you are an alien who wants to build colonies in other aliens’ star systems, while Senat is the adaptation of an antique Egyptian forerunner of backgammon… By now there are 138 games you can play with this basic set of pieces, dices, pawns etc. I’m fascinated by the idea and by the way the community of practice (or community of passion?) around it works. I would love to develop a similar approach with my colleagues who use Net-Map and adopt and adapt the rules in the field according to their needs, make it a process map, bundle or differentiate actors, invent new symbols for bottlenecks and future links, combine it with timelines, try out different ways of combining the knowledge of more than one interviewee etc. Try it out and you’ll see that it is a very easy way of being much more organized that with your standard to do list. 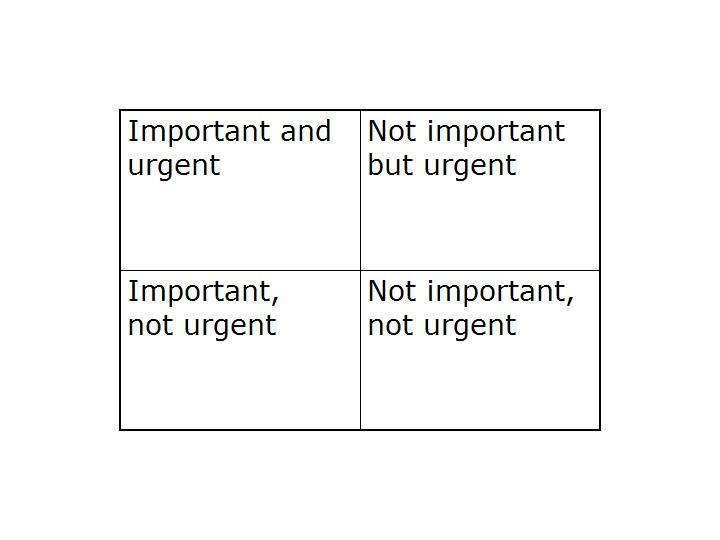 You think you don’t need the “not important, not urgent” square? But that’s where a lot of the fun stuff ends up. And by having your “to dos” organized like this you know that they are the cherry-on-the-top-stuff that you shouldn’t spend the majority of your time with. For example writing this post has been in the “not important, not urgent” box for quite some time. But maybe it’s still useful. Paolo makes an interesting point below about the research philosophical issues you would run into by developing what he calls Net-Map 0.2. The fact that by rating links following a mechanical rule (depending on their distance to the interview partner) one does not necessarily get closer to meaning and that it might lead us into a well known dead end to try to look for “the” reality by adding everyone’s story up quantitatively. Also, when I thought about it more, I realized that we might run into a number of “internal” methodological problems. 1. I don’t know of any SNA program or algorithm that deals with weighted links. So finally, if we wanted to analyze anything quantitatively, we’d have to decide on a cut-off point (define that only links of a certain weight and above will be included) – how would we decide on that and would it make sense? Do you know if someone you know knows someone else you know? This is a question that makes mapping networks tricky, if you go beyond everyone’s immediate links. When doing Net-Maps, we normally ask: “Who is involved in XY? How are they linked?” So our interview partners give us some information about their own links but also on the linkages between others. Krackhard has coined the term “Cognitive Social Structures” for these kinds of perceived networks and proposes stacking the network perceptions of different interviewees on top of each other to get a more realistic view of the whole story. My colleagues Noora Aberman and Klaus Droppelmann developed the idea of ranking the links with the following in mind: The more steps away from your immediate links something happens, the less sure can you be about it. So while adding the different networks up, links that involve the interview partner would have a heavier weight than those that are one step removed. The links one step removed would again have a greater weight than those two steps removed. Does anyone know of a study where this approach has been tried? What do you think? We learn about the Net-Map method as we go and define it as we use it. 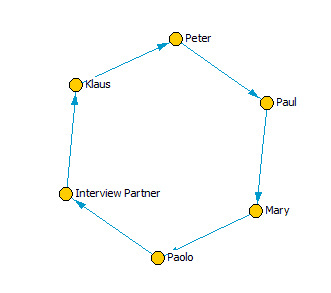 One problem we often encountered is: How do we consolidate different views of various interview partners to get to a common network map that describes the situation? There are quantitative approaches to this, but I am wary about them, not only because they can be rather work intense and complicated but also because of the many assumptions you have to make and the kinds of distortions you get (e.g. one interviewee said A and B are linked, the other one said they are not – it’s likely that the second interviewees perspective is not represented in your combined map…). First get a basic understanding of the issue you want to analyze and who might be knowledgeable about it. Step 1: Interview a diverse mix of stakeholders and experts in individual interviews. Step 3: Invite interview partners and possibly others to a workshop where you introduce this consolidated map and discuss it with the participants as a way of validation. of mine are novels. One sister calls me a Buchtrinker (bookdrinker) because of the speed with which I gobble my books, the other one says: “Letter addict”, because she knows that I’ll also read the back of every corn flakes box or tomato tin in the house. Most of the times I forget the story as fast as I read it though, and it’s more likely that I remember the color of the cover and the feel of the book than the title and author. Well, I have been thinking about keeping a reading list for a while and finally I’ve decided to wait no longer, here it is, the bookdrinker blog. I’d love to hear what you think about these books, if you’ve read them and maybe you can recommend others with a similar color of the cover or feel to it.